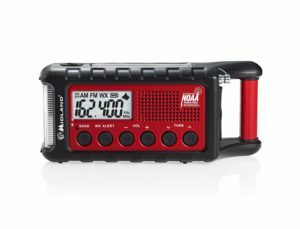 Below is a list of unique accommodations in which we’ve stayed and had great experiences. With so much to do at the Embassy Suites Mandalay Bay, you don’t even have to leave the resort to enjoy your southern California getaway. 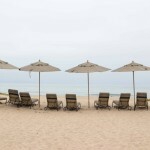 Set on 8-1/2 acres, this Embassy Suites is the only all-suite beachfront resort in southern California. Beautifully decorated rooms include a private bedroom and two bathrooms. Enjoy gorgeous ocean views, cascading waterfalls, and lush tropical greenery as you sip a cocktail during the complimentary Evening Reception. Activities include a pool, beach, fitness center, tennis, surrey bike rentals, and more. Your stay includes an extensive breakfast buffet with cooked-to-order options. Read more about Embassy Suites Mandalay Beach. 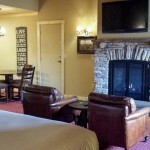 Keep cozy with a fireplace suite at the Sierra Nevada Resort and Spa. Even the bathroom is toasty with a heated floor—and a heated toilet seat. 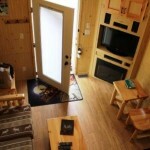 A kitchenette with cooktop, sink, microwave, and mini-fridge allows you to prepare your own meals. If you prefer to have someone else cook for you, an on-site restaurant, The Rafters, is open for breakfast and dinner. Additional restaurants are available seasonally. Cub Club offers a supervised game room for kids four years old and up, and the mini golf course is fun for kids and adults alike. Read more about Sierra Nevada Resort. Th 13-suite castle-like Goldmoor Inn sets on 21 acres atop a bluff overlooking the Mississippi River. Our 854 square foot suite included a king-size four-post bed, fireplace, king-size four-poster bed, a heated towel rack in the bathroom, and a kitchenette with a microwave, mini fridge, sink, and small dining table. Our suite opened into a common room with access to an outdoor deck. Besides suites, the Goldmoor Inn offers three beautifully appointed cottages and two cabins. A gourmet breakfast is included, which you can choose to have delivered to your suite or in the dining room, which you can watch cardinals and chickadees flutter outside the window. The dining room also serves dinner, open to both guests and non-guests. Read more about Goldmoor Inn. Pheasant Run, an Illinois icon, has been welcoming guests since the 1960s. Choose from standard rooms along the golf course, the 16-floor tower, or bi-level suites. Adults can enjoy a round of golf during the day and a performance at Zanies Comedy Club on weekend evenings. The resort offers plenty of family-friendly activities, as well, including craft projects, evening movies, scavenger hunts, and an evening bonfire. Swim indoors or outdoors in the the first indoor/outdoor pool in the United States. The resort’s restaurants include the upscale Harvest, with menu options like Cedar Plank Salmon Filet with a soy-maple glaze; the more casual Jambalaya for sandwiches or gumbo; and the walk-up counter at Terrace Cafe for sandwiches, salads, and pizza. A Sunday breakfast buffet includes made-to-order omelets, fresh fruit, biscuits and gave, red velvet waffles, and much more. Read more about Pheasant Run Resort. Explore Superman’s hometown of Metropolis by day. By night, retire to the elegant Summers Riverview Mansion. Two blocks from the Ohio River, the mansion was originally owned by a Metropolis business magnate. It featured the city’s first elevator. The elevator was removed to install full baths in each guest room. Furnished with antiques and oversize Jacuzzi tubs, three of the five guest rooms also feature a canopy bed. Wake to a three-course hot breakfast, and spend down time with a stroll in the gardens. 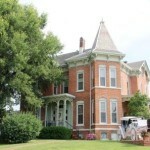 Read more about Summers Riverview Mansion. Under new ownership in 2017, the Cornerstone Inn, located in the Washington, Illinois, historic downtown square, has been completely renovated. The inn offers seven spacious ultra-modern rooms. 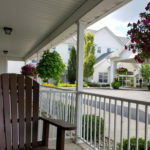 With your stay you receive a gift certificate to use for breakfast at Denhart Baking Company, which occupies space in the same building as the inn. Adjacent to the Par-A-Dice Casino, the 202-room hotel is conveniently located across the Illinois River from downtown Peoria. Rooms are spacious, 350 square feet in the Deluxe King and Deluxe Two Queens room, up to 750 square feet in the Premier Suite. Free shuttle service is provided to the casino. 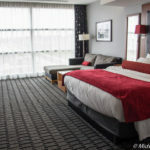 This contemporary boutique hotel is perfect for your stay in the Champaign-Urbana area. Located on the University of Illinois campus, it’s within walking distance of Memorial Stadium. The 128 guest rooms, including two suites, sport Italian leather headboards and footboards and granite bathroom counters. With two comfy bathrobes, you can both stay cozy as you relax. For breakfast, the I Cafe features Starbucks coffee and offers an assortment of juices, yogurt, pastries, and panini. Read more about I Hotel. 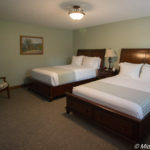 Relax at Prairie Guest House after spending the day at Conner Prairie, the interactive history park, located across the street. The nine-room inn is set on two acres with lovely gardens. Rooms are large and each has a private bath. A home-cooked breakfast is served in the 1900s cottage across the courtyard. A yoga studio is also on the grounds of the guest house, and guests are welcome to join a class. Specializing in romantic weekends for couples, Serenity Springs does it right. You’re carried to your cabin by horse and carriage (sleigh in winter). All cabins include a whirlpool tub for two, gas fireplace, dining area, a deck with a gas campfire and grill, and a water view. Receive special treats, like the makings for s’mores each evening, and a continental breakfast basket in the morning. If you want a breath of fresh air, borrow a bicycle and ride the resort grounds, or visit the activity barn, where you’ll find a bumper pool table and an assortment of board games. They think of everything here, including feed for the waterfowl and bath salts for your whirlpool tub. Read more about Serenity Springs. Located just a mile from the popular Brown County State Park, Creekside Retreat is a fully renovated former apartment complex. Choose from a variety of room options, from a king to a multi-room suite with full kitchen facilities. A central courtyard offers seating around a gas fire pit, perfect for relaxing after a day in the park, visiting Nashville shops, or driving the back country roads. A 2,400 square foot conference center, with an adjacent 4,800 square foot patio, is perfect for family reunions and other events. Read more about Creekside Retreat. Amenities and activities at the Blue Gate Garden Inn go beyond what you might expect from a mid-range hotel. Choose from a variety of room styles, from a King with adjacent patio or the Family Fun Suite. An arcade, pool, outdoor basketball court, and a bonfire are among available activities. The Ice Creamery is popular for an evening treat. A huge breakfast buffet, including made-to-order omelettes and pastries from the Blue Gate Bakery, is included in your stay. Read more about Blue Gate Garden Inn. You don’t have to own an RV or even a tent to camp at Lake Rudolph, although you’re welcome to bring your own. You can rent an RV or glamp in a cabin at this camp resort just outside of the Holiday World theme part. Take part in planned activities, rent a paddle boat, or cool off in the water park. The park provides a free shuttle to Holiday World. Read more about Lake Rudolph Campground. This renovated inn in historic Madison county is designed to have the look and feel of a riverboat. 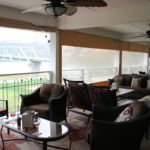 Located on a hill overlooking the Ohio River, the shared patios, furnished with comfortable patio furniture, offer stunning views of the river. Request a riverfront view room, if possible. Each room is uniquely decorated. Queen rooms are small; if you need extra space, request a double queen. Complimentary breakfast. Games and puzzles are available in the lobby. Enjoy a nightcap in the hotel lounge. The 1881 10,000-square-foot home offers seven guest rooms, each with a private bath. From the third-floor rooftop view the lights of Louisville, Kentucky, across the Ohio River. The Big Four Bridge, a pedestrian bridge that connects Jeffersonville with downtown Louisville, is within walking distance of the inn. A breakfast spread of sweet breads, fresh fruit, juice, and yogurt are served buffet style. Choose from a menu for your breakfast entree, which includes basic eggs and pancakes but also a breakfast panini, breakfast pudding, and a daily chef’s choice. Read more about Market Street Inn. Located in historic downtown Corydon, the Kintner Inn first opened in 1873, at which time Corydon served as Indiana’s capital. It was known as the most fashionable hotel in the city. Over the years it served as a doctor’s office and other businesses. Today the beautifully restored inn offers 15 guest rooms, each with a private bath and a fireplace. 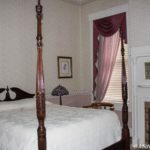 Rooms are furnished with Victorian antiques, some of which are original to the inn. The plentiful breakfast is served at a communal dining room table. Read more about the Kintner House Inn. The fully restored hotel is as chic as it was in its late 19th century heyday when people flocked to the resort for its healing mineral springs. Today you can still enjoy a mineral bath in the indoor comfort of the hotel’s spa. If a spa isn’t your thing, the resort offers plenty of other activities, including golf, horseback riding, and walking trails. 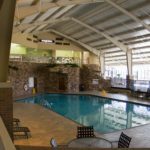 The family-friendly hotel also includes a fun indoor pool, bowling alley, and arcade. A trolley runs between resort attractions, including a casino. Several dining options are available, from casual coffee shops to upscale dining. 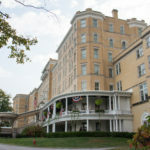 Read more about the French Lick Springs Hotel. At the time the hotel opened in 1902, it boasted the world’s largest free-spanning dome in the world, at 200 feet. No longer the world’s largest, the dome in the hotel’s atrium is still impressive. Millions of dollars were invested to restore the hotel to its early 20th century opulence. Sit in a white rocker on the expansive covered porch which overlooks the gardens, or stroll through the gardens, popular for weddings. The indoor pool is one meter short of being Olympic size. Take a tour of the hotel to learn the fascinating history of both the hotel and the area. Dining options vary from casual to the upscale Sinclair’s Restaurant. 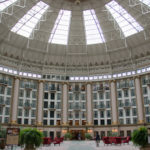 Read about the West Baden Springs Hotel tour. Editor’s note: This is the only hotel in this listed in which we did not stay. However, we stayed in its sister hotel, the French List Springs Hotel, and we toured the West Baden Springs. 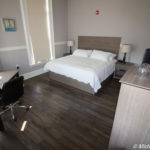 In this chic boutique hotel is run by the Kirkwood Community College hospitality staff and students, every detail is perfectly executed, from check-in to accommodations. Rooms are spacious and comfortable and include amenities like a chase lounge and floor-to-ceiling windows. Monday through Thursday enjoy a glass of wine in the lobby during the hotel’s happy hour. Wine options include a semi-sweet white made in the school’s winery. The hotel’s Class Act restaurant changes settings three times daily, from casual to fine dining, to provide different experiences for diners as well as for the students. 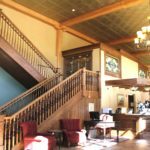 Read more about the Hotel at Kirkwood Center. 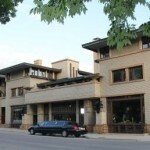 The last remaining hotel designed by Frank Lloyd Wright, the Historic Park Inn has been fully restored. 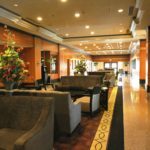 Extensive use of art glass, clean horizontal lines, and recessed entry doors are some of Wright’s trademark features you’ll find in the Historic Park Inn. The original 43 guest rooms have been converted to 21 rooms in order to add bathrooms and other modern conveniences. Read more about Historic Park Inn. Originally opened in 1905, in later years the historic downtown Decorah hotel fell into disrepair. Following extensive renovation, the 34-room hotel reopened in 2000. The original mahogany entrance door flanked by limestone pillars still welcomes guests. The hotel’s centerpiece is a three-story octagonal rotunda topped with a stained glass ceiling. The on-site restaurant, Restauration, serves breakfast, lunch, and dinner and specializes in dishes using locally sourced foods. 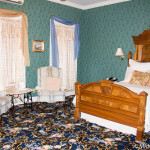 Two historic buildings make up the 18-room Kingsley Inn, which is run like a bed and breakfast. Lavish Victorian decor and period antiques take you back to building’s mid-19th century beginnings. All rooms include a private bath, some with a spa bath or fireplace. 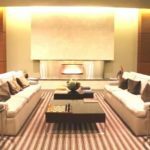 The large luxury Governor’s Suite, with a separate bedroom is rented for extended stays or private parties. The first-floor club room is a gathering place popular with rail fans who visit to view the Burlington Northern Santa Fe trains that run directly across the street. Breakfast is included with your stay. Read more about the Kingsley Inn. The Catfish Bend Inn and Spa is the adults-only part of the Pzazz entertainment complex, which also contains a casino. You must be 21 or older to stay in this hotel which boasts 40 luxury suites and includes a complimentary breakfast. At the opposite end of the property, the Pzazz! Resort Hotel offers rooms that cater to families, with a queen or king bed plus two to four sets of bunk beds. 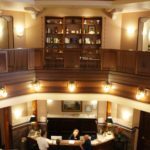 An extensive arcade, outdoor water park, electric go-karts, bowling alley, and more..
Springfield’s first boutique hotel gives a nod to the building’s history as a Masonic Temple with Masonic symbolism throughout the building. The downtown hotel also displays local art works, including a hand-crafted 90-globe light fixture in The Order, the hotel’s restaurant. Guest rooms include high ceilings, handmade light fixtures, roomy bathrooms, and push button lighting controls. Even the window shades are adjusted with the touch of a button. The Order serves breakfast, lunch, and dinner. Its menu lists the suppliers of locally sourced foods. 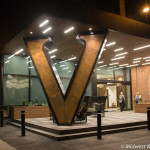 Read more about the Hotel Vandivort. Immerse yourself in the ambiance of the old west in this historic hotel, named for the volunteer cavalry unit led by President Theodore Roosevelt. Rustic elegance exudes charm, from the floor-to-ceiling stone fireplace flanked by huge book cases in the lobby to the Teddy Roosevelt teddy bear perched on the bed in guest rooms. The old west atmosphere extends beyond the hotel to the entire Medora area surrounding the hotel. The hotel’s restaurant, Theodore’s Dining Room, offers dinner entrees like Canadian Walleye or Braised Bison. For breakfast order lemon ricotta hotcakes with fresh berries. For a larger appetite, choose the Rough Rider Benedict. 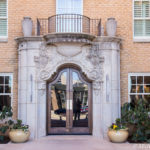 Situated in Oklahoma City’s trendy Midtown district, this 54-room bourtique hotel is housed in the historic Osler Building. The building’s exterior maintains its historical early 20th century revival style, but the interior is modern, trendy, and sophisticated. The cozy lobby invites you to sit and relax for a bit. Guest rooms include plenty of space. The on-site Viceroy Grill offers upscale cuisine all day. For a nightcap, head to the 7th floor O Bar and enjoy the nighttime view of the city. 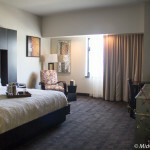 Read more about Ambassador Hotel Oklahoma City. 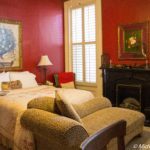 Just seven miles from Hershey, the Red Umbrella B&B is located along an old stagecoach trail on property that once belonged to William Penn. 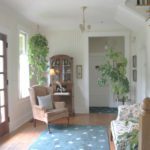 The first floor of the B&B is rentable living space, and all other guest rooms are on the third floor. Suites vary from small to large, but even the “small” offers plenty of space to relax. The large grassy yard includes a nice seating area, complete with a barbecue and a waterfall, perfect for unwinding after a day at the Hershey attractions. Plated breakfasts include such dishes as strata served with potatoes and bacon or French toast served with banana syrup. 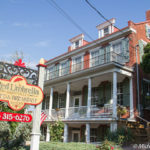 Read more about the Red Umbrella Bed and Breakfast. 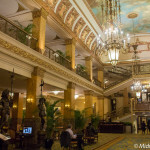 Built in 1893, the Pfister was known as the “Grand Hotel of the West.” The hotel still maintains its grandeur. Massive chandeliers hang from the lobby’s domed ceiling, which is painted with puffy cumulus clouds and cherubs and accentuated with gold trim. A 1960s 23-floor guestroom tower was recently renovated. Guest rooms include all the comforts of a luxury hotel. The 23rd floor swimming pool offers sweeping views of the city. A nightclub and spa also share the 23rd floor. End your evening in the lobby piano bar, taking in the hotel’s opulence. Read more about Pfister Hotel.